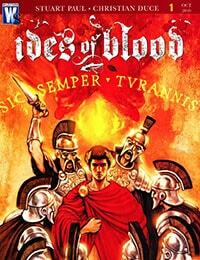 Ides of Blood Average 0.00/5 - out of 0 total votes. The year is 44 B.C. Julius Caesar has conquered Transylvania, and vampyres are Rome's new slave class. But when rich mortals start turning up dead with fang marks on their necks, Valens, a vampyre slave-turned-Roman soldier, plunges into the blood-soaked underworld of Rome to capture the Pluto's Kiss Killer. If he can prove himself, he'll earn rank and riches beyond what anyone this side of the Tiber has ever seen! But if he fails, he just might find himself on top of the pile of bodies! Don't miss this crimson-red, 6-issue thriller that mixes the undead intrigue of True Blood with the brutal Roman action and political drama of Spartacus from newcomers Stuart C. Paul and Christian Duce!